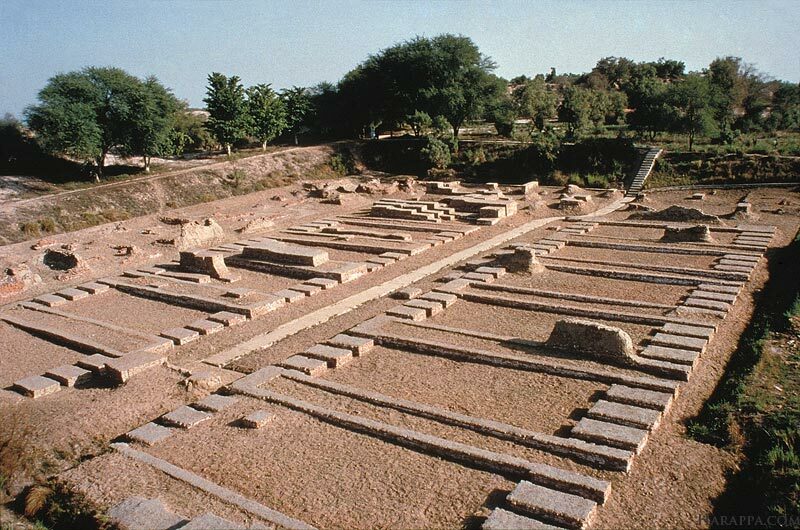 The so-called "granary" of Harappa is found on Mound F. It is a brick structure that was built on a massive brick foundation over 45 meters north south and 45 meters east-west. Two rows of six rooms that appear to be foundations are arranged along a central passageway that is about 7 meters wide and partly paved with baked bricks. Each room measures 15.2 by 6.1 meters and has three sleeper walls with air space between them. A wooden superstructure supported in some places by large columns would have been built on top of the brick foundations, with stairs leading up from the central passage area. Small triangular opening may have served as air ducts to allow the flow of fresh air beneath the hollow floors. No special concentrations of burned grain or storage containers were discovered by the earlier excavators and the interpretation of these structures as granaries is based on comparisons with Roman buildings and has no parallels with any building tradition in South Asia. Most scholars agree that there is little evidence for the construction of massive granaries at either Mohenjo-daro or Harappa and that these structures should only be seen as evidence for large public buildings. Rulers and state officials probably did meet in such large public buildings and many of them may have been used for specific religious functions, but their specific function will always remain a mystery.